Young people are transforming conservative strongholds in this country. Take Iowa, the Midwestern home of Chuck Grassley, the 27-year GOP Senate veteran who got Brett Kavanaugh confirmed to the Supreme Court, and Steve King, the 4th District Congressman who openly espouses white supremacy. Jack is one of the many Student Action members across the country who knocked on doors to elect Axne and other Democrats who align with our values, and who we will hold accountable as we move towards our goal of Free College for All. In this election cycle, Student Action organizers knocked on over 48,000 doors in Maine, Illinois, Iowa and California to flip key districts and pass ballot initiatives. We’ve had over 14,000 conversations with other young voters, and identified 6,000 supporters for our candidates and ballot measures. All the while, we’ve been building student power. As the Organizing Director at Student Action, a national organization working to support Free College for All, I’ve had the good fortune to spend time with Jack and other student leaders all across the country. In the past year, I have spent time on over 40 campuses, and I’ve met many of the students who are building the groundwork to elect progressive leaders in 2020 so we can achieve this goal. For us, Free College for All is not just a pie-in-the-sky aspiration: it’s the only answer to rising costs, which increasingly put higher education out of reach. Nor is it only about tuition: many of today’s students have to choose between books and meals, and in some areas, like California, face homelessness because of sky-high rents. These last five weeks, I’ve been in Orange County, California. Like Iowa, Orange County has long been reliably Republican – the home of Goldwater Republicans and Ronald Reagan’s tax revolt. But Orange County is changing, and students are leading the way. Orange County has produced many architects of the conservative movement, including Richard Nixon, Fred Schwarz of the Christian Anti-Communism Crusade, and Robert Welch of the John Birch Society. But Orange County, like many other conservative strongholds, is transforming, and students are leading the way. Its Latino and Asian populations are growing quickly, and the GOP’s advantage over Democrats in the County has also shrunk to just 2.8 percent, primarily because voters under the age of 30 are registering as Democrats. Student Action members organized here for congressional candidate Katie Porter, a consumer protections lawyer who supports our goals, in her bid to unseat two-term Republican Mimi Walters. Walters had voted for the Keystone XL pipeline, to repeal the Affordable Care Act, and against common sense gun laws. While this race is still too close to call, we’re proud of what we’ve accomplished. At the University of California Irvine, student voting has increased from 2 percent to 31 percent this cycle. Many of the over 27,000 students we engaged are ready to continue the fight: for free college, universal healthcare, immigration justice, and a world where all people can live with dignity and justice regardless of of age, gender, sexual orientation, (dis)abilities, geographies, citizenship status, criminal record or incarceration status. In Maine, students at four colleges – Bates, UME Orono, Bowdoin and Central Maine Community College – turned out to support the congressional candidacy of Jared Golden, who as a Marine Corps veteran attended Bates college for free, and wants more students to have the same opportunity. Just as in California, this race is also still too close to call. While we anxiously await the results in CA 45 and ME 2, we’ve got no time to waste. 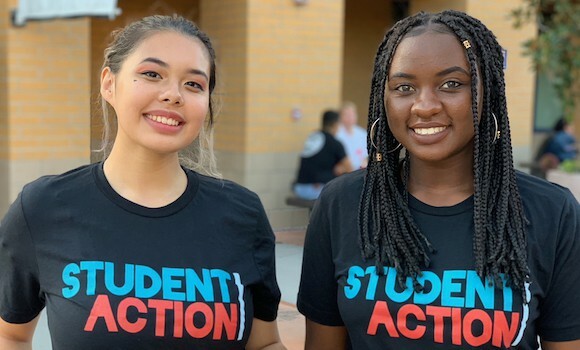 Win or lose, Student Action’s student organizers are already planning public meetings, direct actions, chapter launches, and more. In California, where cities like San Francisco have already passed municipal measures to offer free college to residents, we are looking to introduce statewide free college legislation soon, and will put pressure on local state representatives until they sign on. In Iowa, we will keep the heat on DMACC’s board of directors until we win the first free community college in the state.